In 1985, novelist Ian Slater published Orwell: The Road to Airstrip One, a very mediocre book about a very exceptional man. In 2003, Slater and his publishers released a second edition of the book because of all the attention Christopher Hitchens drew to the subject with Why Orwell Matters a year earlier. How do I know this? Because Slater himself tells us as much on the first page of his updated preface. Not that there's any real harm in this — after all, why should one not capitalize on a good thing? As Slater writes, “In Orwell: The Road to Airstrip One I have tried to show not only why Orwell matters now but why he will always matter” (his italics). It's not that Slater has anything against Hitchens; quite the contrary, really. It's just that he wants us all to know that he was the first to explain why Orwell matters, so shouldn't he receive some recognition as well? Well, outside America, Hitchens's book is titled Orwell's Victory, which begs the question: Had that also been the prevailing title in America, would Slater then being claiming that he was the first to explain how Orwell won and how he will always win? Something was certainly needed to rationalize the reissuing of this — pardon me — droning book, which nobody read in the first place and, as it appears from the Amazon rankings, nobody is reading all over again. Slater offers another advantage that Airstrip One ostensibly has over Why Orwell Matters: “Hitchens' book is largely a skewering of critics who, willfully or unwittingly, misquote Orwell for their own purposes, and it assumes that the reader is familiar with the British literati. Mine does not.” Aside from this rather reductive description of Hitchens's book (as part of an intricately detailed description of the intellectual and historical context in which Orwell wrote, Hitchens deals with the French and American literati as well), Slater assures that we don't have to be well-read to appreciate his book. Instead of providing a critical analysis of Orwell's work, or a biography that offers fresh insight, Slater instead fortifies the reader with a series of protracted and often brutishly technical book reports on Orwell's novels and non-fiction work. Why the reading public would be clamoring for a plodding, 300-page introduction to a figure already so well known is your guess. More than fifty years after his death, writers who address the subject of Orwell and what he still has to teach us are obligated to engage, reinterpret, and/or tie his work into a larger discussion of contemporary culture and politics. It is not only senseless to just serve up the old assumptions regarding Orwell, it is useless. Slater confines the reader to a descriptive assessment of the political and ideological debates over Orwell: was he really a socialist? Would he have been a conservative in his old age? What about “The List”? But he avoids provocation or any of his own speculation. Opportunism aside, Slater nevertheless affords one the chance to revisit the truly fascinating story of Eric Blair/George Orwell. To his credit, Slater supplies a fairly comprehensive, if bland, platform from which to do so. Orwell remains interesting and relevant, in part because of passages like the one I plucked from Slater's book to open this review, which in addition to ridiculing politicians, you'll notice takes a nice dig at the herd of churchgoers as well. However, the process of identifying the issues that establish Orwell's ongoing relevance (or explain why he will always matter) is not easy. There are many instances to choose from: his campaign for free speech, the struggle against orthodoxy and conformity, the need for clear and direct writing, to name just a few. The Soviet Union and the German Nazis have passed on, but the totalitarian mentality obviously has not. Many of Orwell's targets remain as pervasive as ever; they just wear different faces. For Orwell, “freedom” for a writer meant the freedom to criticize and oppose anyone and everyone, including those closest to you. Orwell was a socialist and so wrote, “paradoxically, in order to defend Socialism it is necessary to start by attacking it.” Just the same, in order to defend the Democratic Party, one must identify what is wrong with it. Or, in order to defend a war in Iraq, integrity requires one to point out everything that has gone wrong. Applicable to all ideologies and allegiances, this is a principle you either understand, intellectually and intuitively, or you do not. The critical disposition does not evolve from a demand for ideological purity, but rather results from one for intellectual honesty. Consider this recent case: after making his service in the Vietnam War the theme of his acceptance speech at the Democratic Convention, John Kerry thereafter refused, strangely, to answer specific questions regarding his service, or to explain statements he had made that were critical of that same war after he had returned to Massachusetts. He served honorably, and that's all there is to it — or so it went. However, as a public official during the Seventies and Eighties, Kerry was quoted on numerous occasions of having said he engaged in battles in Cambodia on Christmas Eve 1968 (a country that was neutral, at least ostensibly, at the time). “The absurdity of almost being killed by our own allies in a country in which President Nixon claimed there were no American troops was very real,” Kerry said. This memory, Kerry said, was “seared — seared into me.” Indeed, during a major speech as Senator in the Eightie, Kerry harnessed the supposed experience as an occasion to critique U.S. foreign policy. Well, the military has no record of Kerry or his crew ever in Cambodia and the historical record suggests such an occurrence highly unlikely, particularly in December 1968. Furthermore, Lyndon Johnson was still president in December 1968, not Nixon. If such memories are so vivid for Kerry, how, one wonders, did he get it all wrong? Didn't the public he sought to represent at least deserve an explanation? Not according to Democrats. Those of us who thought the public warranted some clarification on the point were shouted down and censored on grounds that the subject was a red herring designed to aid the Republican Party, end of story. The implications of this incident — and the simultaneous bullying of the honorable Ralph Nader campaign — were clear: Individual thinkers and alternative views have little room in most societies, especially one dominated by two power-hungry political parties. The only criticism tolerated in our “democracy” is that which comes from within the system, or from “inside the whale,” as Orwell put it. Orwell recognized the menace this sort of groupthink mentality posed from the beginning. His service as a young colonial officer in Burma exposed him to the deleterious effects of British imperialism on both the exploited and the exploiter. Slater writes: “Orwell sees the larger problem… of the autonomous individual doomed to an anxiety-ridden existence, torn between what his conscience tells him is right and the expediency that is nurtured by the need for brotherhood.” Imperialism in the traditional sense of the concept is no longer a reality, but the struggle between the individual and consensus beliefs, or the pressure on the former to conform to the latter, is as real as ever. The eagerness to be a part of something, whether it's a religion, a political movement, a marriage, a magazine, etc. can be as threatening to independence and free-thinking as any government-imposed manner of conformity. Additionally, Slater paraphrases Orwell when he writes that the “worst advertisements for socialism… were its adherents.” The complacency and snobbery of people who imagine themselves liberal thinkers and intellectuals (pick your favorite “highbrow”), in spite of no real connection to the working classes, is as contemporary an “issue” as it was in Orwell's time. There is much to be said about the decline of unions and working-class support for the Democratic Party, analogous to what Orwell saw as the primary problem with socialism — namely, a disconnect between socialist intellectuals and the people they affect to embolden. Orwell, who made it a point to live amongst the down and out in Paris and London and the coal miners of Wigan Pier, was bitterly critical of socialists who spoke out against poverty without ever having bothered to experience it — or even witness it — firsthand. Orwell criticized academics and other likeminded folk who failed to engage the world as something personal and concrete, rather than an indifferent abstract. As Slater quotes Orwell: “It is impossible to think without talking,” which is an obvious exaggeration, amplified to make the point that a self-imposed isolation from the world is not the way to free and critical thought, either. This point adds a layer of complexity to Orwell's view of the individual versus society: truth, Orwell felt, could not be reached in a vacuum. 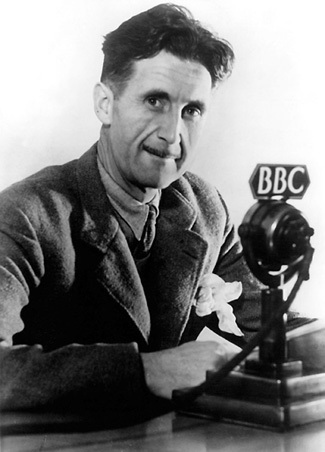 Another one of Orwell's lessons that hasn't quite registered: any suppression of free speech, as he acutely noted, is a “fascizing process.” Circumstances are irrelevant: there is no intelligent reason to suppress — in any way, shape or form — the free verbal or written expression of thoughts and ideas, whether the controlling act is committed by the government, a political party, or even publishers and editors who choose to suppress “disagreeable” views, rather than consign themselves to restraining the worst impulses of bad writers. Orwell had a hell of a time finding outlets for his work solely because people feared and detested his politics. Even Victor Gollancz, the founder of the Left Book Club, which had published Orwell in the past, refused to accept Animal Farm in 1944 on ideological grounds. As an editor at Faber and Faber, the prestigious British publishing house — and the sole American on the board — T. S. Eliot also declined to give Animal Farm his support, as he was fearful that publishing it would offend Stalin. Moreover, when Animal Farm was released throughout Europe, the American military collected as many copies it could find and sent them to the Soviet Union to be destroyed. How envious latter-day “realist” politicians and would-be censors must be for a time in which it was so easy to block the distribution of the written word. The reply that the US military no longer conceals and censors to the extent it used to, by the way, is only made possible because of the Internet and an expanding international media, not because the military now praises openness or eagerly volunteers information. According to Slater, Homage to Catalonia — my favorite Orwell book — had sold only 900 copies by 1950, roughly 12 years after it was first published. Editors and publishers dropped it like a hot brick: they couldn't translate the essential discovery Orwell made during the Spanish Civil War — of a principled, strong left movement opposed to both Franco and the Communists — back into their preconceived notions of Right and Left. Furthermore, Orwell didn't win himself many supporters when he wrote polemics against leftist writers who, in one famous case, as Slater indicates, “failed to report the violent suppression of the [leftist] revolution [in Spain] by the Republican government — especially by the Communists,” because of their political commitments. Orwell's view on “objective” writing is worth bringing to light, particularly in the wake of Hunter S. Thompson's death. Orwell rebuked writers who professed to write objectively (while inevitably finding ways to insert their own prejudices, passed off as neutral commentary). Slater argues that Orwell was more “objective” than most writers precisely because he revealed his own biases from the start. On why dissent is marginalized, Slater addresses Orwell's theories as to why people generally do not resist or question authority. In one of Orwell's novels, Coming Up for Air, the character George Bowling explains why the middle classes are reluctant to rebel: They imagine they have something to lose. They live under the “illusion” of achieving “a stake in the country,” unlike the poor and the destitute. Here, one is reminded of George W. Bush's “ownership society” initiatives (i.e. encouraging widespread investment in the stock market along with yet greater incentives for putting mortgages down on houses and getting married). One of the intentions and effects of modern legislation designed to increase ownership in societies is to pacify and make those who might otherwise doubt and “act out” content with their lot. Increased participation in a conformist “ownership society” also establishes and enhances a collective antagonism toward those skeptics and drifters who attempt to live outside of the whale of this (largely suburban) ownership society. And it breeds indifference to politics. Anyway, I do not recommend Ian Slater's book. There are many better books on the subject, including Hitchens's, which distills and condenses everything Slater has to offer, and much more, in about a fourth of the space. For anyone who hasn't read Orwell (or has only read 1984 and/or Animal Farm), the proper place to begin is either his essay “Politics and the English Language” or Homage to Catalonia, one of the great journalistic accounts of the last century. Slater's only real achievement is unintentional: he persuades me to believe that our governors have actually not learned from Orwell. And in that sense, Orwell's influence is almost certainly overemphasized. Placing the very notion of progress in doubt, one experiences remorse, when reading Orwell, over how little the moral and intellectual climate has changed.